Mark and Eileen Fischer, owners of Off Lease Only and Boats Direct USA, donated nearly $26,000 to children’s charities at the 22nd Annual Emerald Coast Poker Run in Destin last weekend. The Fischers are avid powerboaters, anglers, car buffs and longtime supporters of community charities, especially those that benefit children. The Emerald Coast Foundation’s Boat week, which includes the Emerald Coast Poker Run, raised an amazing $150,000 for charity, with 160 boats participating. 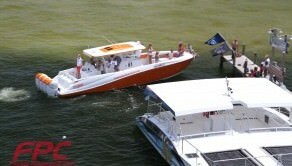 Proceeds from Boat Week events will be divided among four charities in the Panhandle: the Eleanor J. Johnson Youth Center, which provides after-school activities for needy children; Children in Crisis, Inc., which supports an emergency shelter and related facilities for foster kids; AMI Kids, which provides youth development programs for at-risk kids; and Horizons, a grassroots advocacy organization for citizens of all ages with cognitive, intellectual, and developmental disabilities, and their families. Eileen Fischer got the donations rolling by buying a seat at the final poker table with a donation of $3,000. Then Ms. Fischer won $10,000 at the table and immediately gave it all back to the Poker Run charities. The Fischers bought back in again for the last hand, and contributed an additional $12,500. 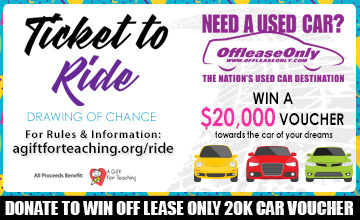 Mark and Eileen Fischer are a quiet supporters of good causes: They have done numerous car giveaways to needy families, sponsored sports teams and donated generously and regularly to an array of child-related charities. The way they see it, donating to the Emerald Coast Foundation made sense because it combined their love of boating with a great cause. “We are honored to be involved with the Emerald Coast Charities and we look forward to going to Destin next year to do it again!” Mark Fischer added. 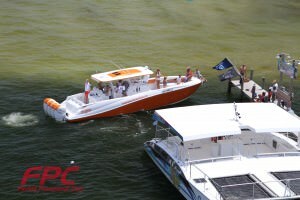 Stu Jones, president of the Florida Powerboat Club, said the Emerald Coast Poker Run just keeps growing. “This year’s event was a HUGE success for the Emerald Coast Foundation! Not only did we raise more money this year than in years past, but we had a blast doing so,” said Jones, who first got involved with the Poker Run 16 years ago. 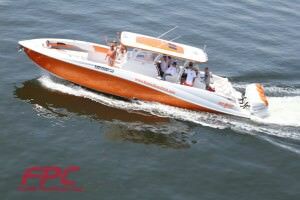 The event marked the Fischers’ first appearance in their flamboyant orange and white Deep Impact 399 Poker Run Edition since announcing Boats Direct USA’s recent acquisition of Deep Impact boats. Deep Impact will be manufactured at the same Miami factory as Blackwater boats. Mark Fischer purchased the trademark and assets of Deep Impact in early August, and is in the process of expanding his manufacturing operations to accommodate production of the custom boats known for luxury and performance. Fischer has been manufacturing Blackwater Boats and Ocean Hawk under the supervision of renowned boat builder Eugenio Uriarte. Fischer has vowed to make Deep Impact even better with Uriarte supervising production. Uriarte’s boats are known for their fit and finish and close attention to detail. The Fischers have long-admired the Deep Impact brand so they were thrilled to acquire Deep Impact and continue producing the boats under the expertise of Uriarte. 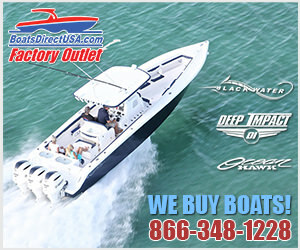 Boats Direct USA, in Key Largo, is the exclusive factory outlet now for Deep Impact and sells both new and used boats. It’s been a busy few weeks for the Fischers, who also announced the expansion of their used car giant Off Lease Only into Orlando. 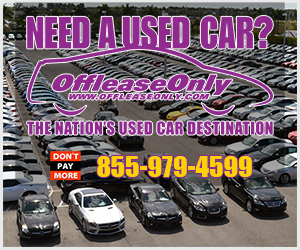 They plan to open a third dealership in Orlando just miles from Orlando International Airport by November 1, 2014. 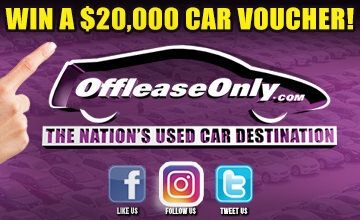 Off Lease Only is nationally known for its unbeatable prices and gigantic selection of like-new used cars. 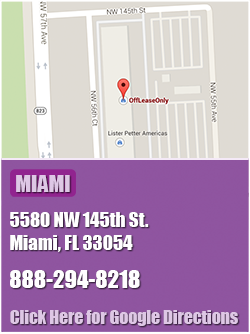 The Fischers currently operate two dealerships in Lake Worth and Miami and are in the process of building a huge new Lake Worth facility to accommodate exponential growth in Palm Beach County. Mark Fischer has big plans for his coming dealership in Orlando as well: Fischer expects to immediately sell 300 cars a month in Orlando and be selling more than 500 cars a month by March 2015. The site includes a sprawling 40-acre stretch that was previously occupied by a rent-a-car agency, situated close to the airport for convenience. Boats Direct USA is the factory outlet in Key Largo of Deep Impact Boats, and the exclusive distributor/manufacturer of Deep Impact, Blackwater Boats and Ocean Hawk. With over 100 new and used boats for sale, it’s never been a better time to schedule your sea trial. 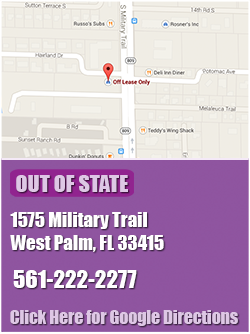 For more information, call 866-377-5403 toll-free or visit the Boats Direct USA showroom at Mile Marker 98. 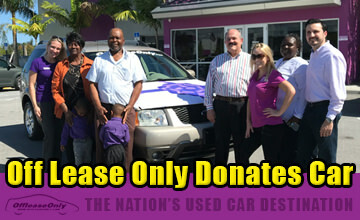 Next Story → Radio Host Rickey Smiley and Miss Kimmy Present Deserving Couple with Donated Van From Off Lease Only!